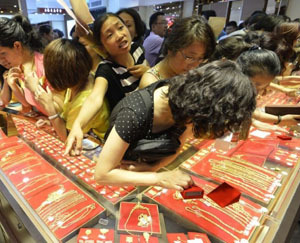 Surat, Nov. 4 - A decline in gold prices led to a huge rush of customers across jewellery stores in Surat. The sudden drop in prices after a year-long high has benefited not only the buyers, but the sellers are also expecting a high growth in sale. "As the gold prices have reduced a lot so the buyers' budget has become limited and the people are also looking at it for investment purpose. Today the gold price is Rs. 26,350, at the rate of 22 carat for Rs. 2,41,000 per 100 grams whereas near Diwali it was 274 and a year or so earlier it was around Rs. 3, 30,000 now the price has reduced to Rs. 2, 63,000," said a jeweller Tushar Choksi. He also said that that it's a good time for buyers as they can now purchase more gold jewellery during the current wedding season. "People are purchasing in advance only. We are expecting 20 to 30 percent growth. Generally we don't see such downfall in gold prices," he added. A customer Ami Makwana said, "I am getting married in February, but due to fall in gold price we are purchasing more gold now only as we can easily afford it." Another customer Jalpa Shah added, "As gold prices have reduced so it's a good chance for future investment. Until now the price was fluctuating but now it's in our budget so I am investing right now so that I can earn profit in future."